In addition to updating our Circulation policy, we also recently revised a few different areas of our Library Use policy. 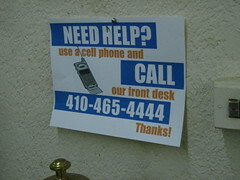 Cellular phones may not be used inside library buildings. Mobile devices such as cellular phones and hand-held computers should be set to "silent" mode. Use of a mobile device in the library should be brief and quiet. Out of respect to other library patrons, prolonged conversations should be moved to a less public area, such as the foyer, the courtyard or the parking lot. Wordier, I know, but hopefully clear and more in line with modern patron needs (though still a bit short of a cell phone lounge). Food and/or drink are not permitted. Food is permitted only in the meeting room during special events and in the outdoor seating areas. Food is not permitted in any other public area of the library. Drinks are allowed throughout the building, but only in covered containers. Care must be taken to avoid spills, and patrons should notify staff if any spills occur. Beverages and waste should be disposed of properly and containers should be recycled whenever possible. The use of tobacco products and alcoholic beverages are not allowed. Funny how specific you have to be when writing policies. "The use of" was added at the last minute, because without it, we realized the policy forbid people from even having cigarettes in their purse, and Library staff is certainly not going to be checking bags. We had input from our Board of Trustees on these changes, so although they won't be officially approved until their May meeting, we've already got them posted on our website. A patron may never notice something like this, but hopefully it'll go a long way towards making everyone's (patrons and staff) library experience better.